Track assets in the field and in the office, accross multiple locations, access and collect data using QR Inventory mobile application. Data collected in the field and entered via the web are stored in a secure cloud, accessible from anywhere in real time. Generate and print QR code labels, use existing barcodes / QR codes or NFC tags. Scan using a smartphone or a traditional barcode scanner. 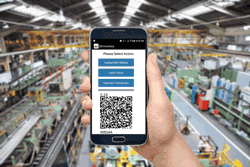 Instantly access assets and inventory information by scanning QR code / barcode with a smartphone. Create custom mobile forms, fill out on the smartphones or tablets. Define what information you need to collect. Simple to learn and use asset tracking system with just the right set of features to get the job done. Use barcode scanning to track assets efficiently and avoid errors. Use smartphones as barcode scanners and as a tool for mobile data access and collection in the field. Use regular barcode scanners for high volume transactions. No manual entries - no errors. Scan barcodes or QR codes to record asset transactions, access or collect information. Use smartphones for QR code / barcode scanning, data access and collection. Process asset transactions, access and input information on site, send data to the cloud in real time. Use what works better for you: regular barcodes, QR codes, NFC tags. Use existing labels or generate and print new ones using QR Inventory. Create custom mobile form(s) that have to be filled out during specific inventory transactions, and employees in the field will be able to fill out the form(s) on their smartphone, take and attach photos if needed. Centralized data that can be accessed from anywhere by all authorized users in real time. Authorized users can access the system from anywhere, on the computers or mobile devices, and always get accurate real time asset information. Host QR Inventory Leased Assets Edition on our servers or on your company's network. Categorize assets, track individually by serial number, manage and monitor assets inventory. Manage asset types and categories via a web dashboard. Select asset type from a drop-down list rather than entering it manually to avoid mistakes. Bulk enter assets of the same type with different serial numbers. Enter asset information once, then paste or scan in all serial numbers. Enter new asset on the client site by scanning asset label with a smartphone, or on the web by scanning in multiple serial numbers in bulk. Asset entries via the web site or on a smartphone are automatically recorded and become a part of an asset life-cycle, which is available via reports. Track individual assets by serial number, access an entire life cycle of each individual asset, from receiving to disposal. Manage and monitor assets inventory - access quantity of assets of a certain type in each location, set re-order level and receive low inventory alerts. >Create custom transactions to document all asset events, record transactions on site or in the office by scanning QR code / barcode labels with a smartphone. Optionally fill out mobile form that accompany asset transaction. Record all asset life time events: receive in the warehouse or office, check in, check out, ship to a client, send to repair, return to the office, damage, disposal and anything else you need. Create custom transaction types via a web dashboard. Record asset transactions on site as they happen using a smartphone. Use smartphone to scan QR code / barcode, and fill out required information. Customize what information needs to be filled out for each transaction type. Optionally, you can record high volume transactions (receiving large volume of assets in the office, shipping to a client), using a web interface and regular barcode scanner. Automatically generate and print packing slip for shipping transactions. Review reports on assets current location and transaction history filtered by multiple paraemeters: dates, client, asset type, transaction type, etc. Add multiple assets to a single transaction, fill out transaction form once. Move multiple assets from their respective locations to a warehouse or an office in one transaction. Current location will be determined automatically by the software - no need to specify it for each item. Create custom fields to hold all required information on the assets (status, new or used, warranty expiration, vendor, etc. ), including images. Your employees can access this info in the field by scanning QR code label on the asset with a smartphone. Create transaction types that make sense for your business (check in, check out, ship to a client, return to office, send to repair, etc. - anything that is a part of your workflow). Create custom mobile forms that an employee needs to fill out when processing an asset transaction. Include everything that you need to keep track of for each specific transaction. Take photos using QR Inventory mobile application and attach to an asset transaction for visual documentation (e.g. document asset condition upon check out and return). Create a list of customer locations, group them for better management, and create custom fields to keep track of any information that you need (company, address, contact, agreement terms, etc., etc.). Attach a reminder to the date fields (such as warranty expiration), and receive an alert when the date is approaching. Specify who will receive an alert, how many days in advance, message subject and text. Attach custom reminder(s) to a date field, such as warranty expiration or next preventive maintenance, and receive automatic e-mail reminder when warranty as about to expire or preventive maintenance is due. Configure all reminder parameters. Set re-order point for each asset type / location, and receive automatic alert when assets inventory falls below re-order point. Use existing barcode or QR code labels, generate and print labels using QR Inventory software, or use pre-printed QR code labels that we supply. If your equipment is already labeled you can use existing labels with QR Inventory. If you need to label assets / equipment, QR Inventory has a tool to generate and print QR code labels, one at a time or in bulk. Print QR code labels one-by-one, download qr codes in bulk to print using a label printer, or download print-ready pdf file with laid out labels for printing on a regular office printer. If you prefer to outsource label printing, we can supply pre-printed QR Code labels in different sizes and materials to use with QR Inventory. Track equipment that you lease out, including IT equipment, heavy construction equipment, payment processing equipment, equipment for events and anything else. Track assets and equipment that you rent out to companies or consumers for a short term. Always know where each item is and when is it due back. QR Inventory works well for the situation where you loan assets or equipment to the customers as a demo. Track who has the asset, how many companies used it as a demo, asset conditions at check out and return, and when it is due back. Track assets which are going out to different customers and then returned back, for example containers delivered to the clients and then picked up when they are empty, testing equipment which is installed at homes during home inspection, etc. Track assets which employees of the company are borrowing and returning, such as work tools or video equipment. Track for what projects or clients assets were used, who has an asset and when it should be returned. Find out where each asset is located, review list of assets in each location or with each employee. Find an asset by serial number, or list assets by various parameters (type, group, assets due to be returned in so many days, assets with warranty expiring in a week, etc., etc.). Review inventory of each asset type in each location (e.g. 2 iPads and 5 computers). Review list of assets with inventory below re-order point. Review an entire life cycle of individual assets, from the time asset was received through rentals, returns, repairs, to asset disposal. Review monetary value of assets in different locations, monetary value of the selected transactions. Reserve assets for the upcoming events, trade shows, projects or clients. Reserve assets via a web dashboard or on a smartphone. Scan in assets that you want to reserve using a smartphone, or search by keywords. Check assets availability for the selected dates based on the placed reservations and expected return dates. QR Inventory will ensure that correct assets are checked out, and check out of non-reserved assets do not interfere with the upcoming reservations. Reserve asset types (e.g. 3 video cameras), check out assets by serial number.